We’re finally here! The last piece of our full loom series for Synergistic Research. We’ll also be closing it out with a Synergistic Research factory tour. 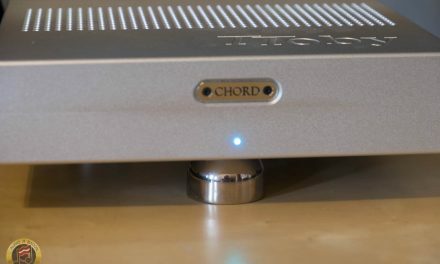 We’ve had quite the adventure– starting with the Active Ground Block SE and accessories like their fuses, moving onto their power products, and room acoustic products. In addition to going over the Tranquility Base UEF and MiGs footers, we’ve had time to review their newly released Excite series of interconnects and speaker cables. We’ve seen certain themes develop with the Synergistic Research products that seem to get strengthened and reaffirmed over time. 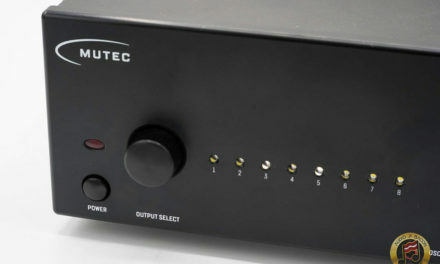 If you think of the power products as the entry products feeding your system and components, and their acoustic products as tuning the air around you, this review will address the products that connect your major components together. 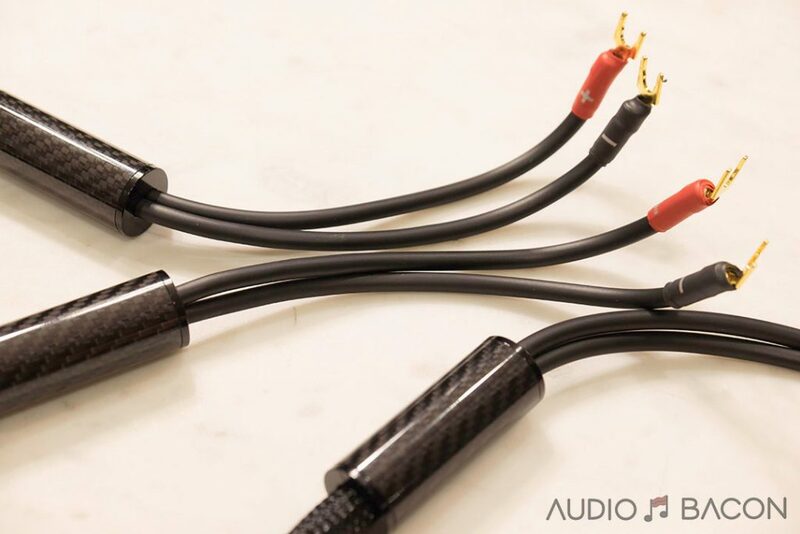 If Ted & team’s goal for their entire line of Synergistic Research products wasn’t clear before, it’ll be obviously clear after hearing these cables. The major changes in design are first, the new UEF Matrix shielding. 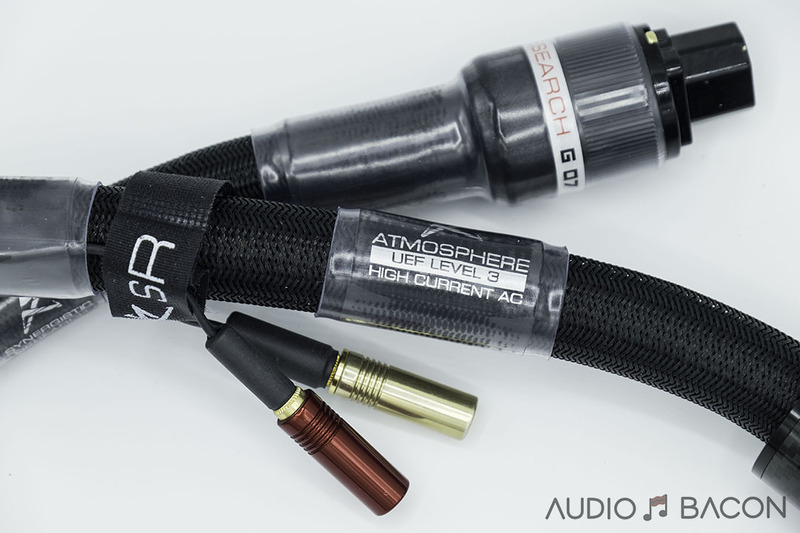 All Atmosphere X series cables feature a new UEF Matrix Shield developed through a direct assessment of how our brains respond to music with and without this new shield topology. Instead of just measuring the system and the cables alone, we developed new test criteria for directly assessing how a listener responds to music selecting only those design options that transferred the greatest emotional response. Second, is the Blue Fuse conditioning process that was originally developed for Blue fuses. 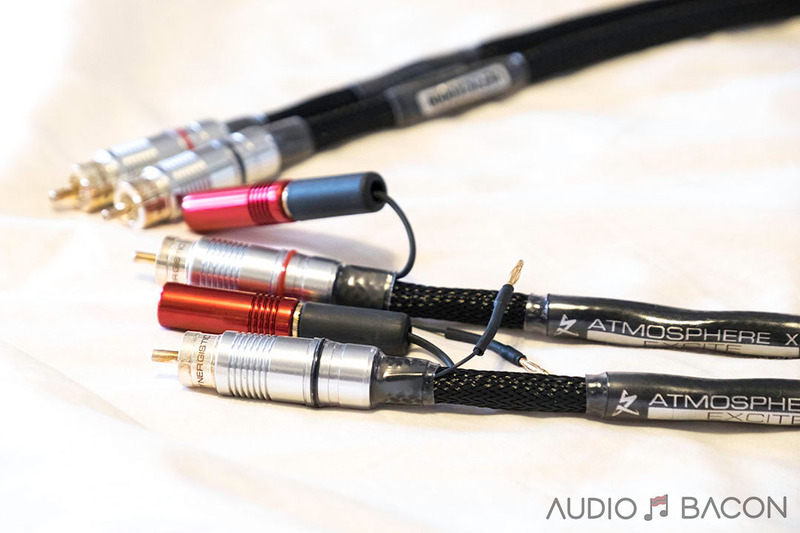 The conditioning process is one of the major additions that gave the blue fuse the performance improvement over the black fuses and is now applied to the Atmo series signal cables. Let’s talk about the cables themselves. Physically, the cables are fairly flexible. This will allow you to get a truer length and avoid adding a foot or two to account for turns and bends. The source end of the interconnect & speaker cables will allow you to place a red tuning module in there. 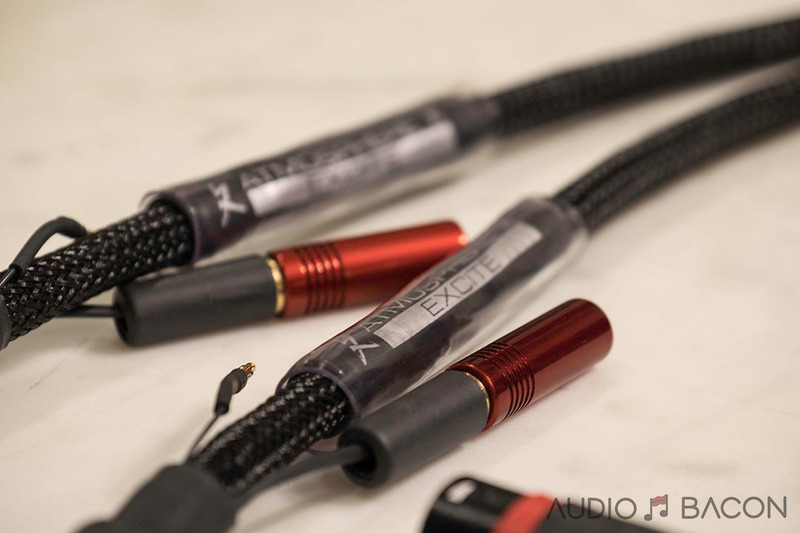 The Excite cables will come with the red ones, whereas the Euphoria will come with both the red and blue bullets. 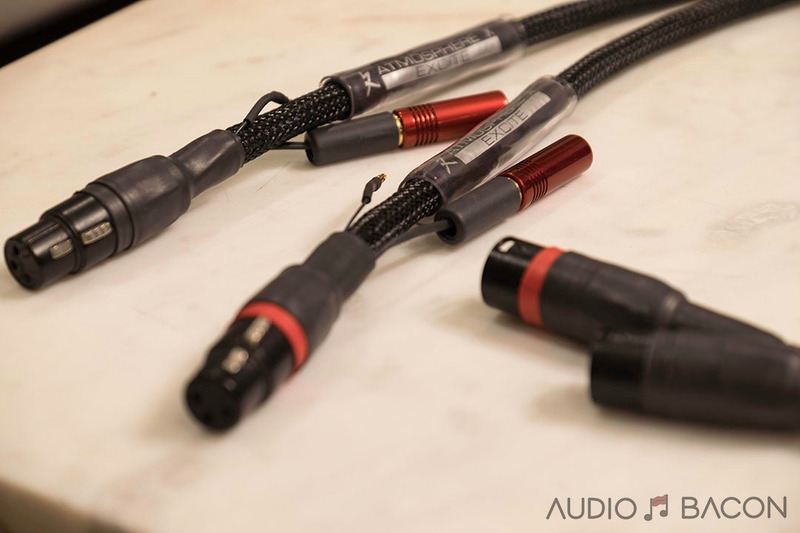 They allow you to tune your cables for a more warm and liquid sound versus something more pinpoint or detailed. In our listening, we generally preferred having the red bullets in the system as opposed to no bullets, and that’s what our review is based on. For the interconnects, you’ll have the opportunity to ground the cables via a mini banana grounding cable that would’ve come with your grounding block. Optionally, you can also upgrade to the HD grounding cable for more performance. Please see our Active Grounding Block review for more details about how that behaves and the corresponding impact. Finally, at the destination end, the excite cable will have the Inductive UEF Filter mentioned above. It’s about an inch wide and a couple inches long, but won’t hinder its flexibility as there is some room between the filter and the cable plug. Each of our systems has a Tranquility Base UEF. Our larger UEF XL has 9 layers of isolation laminate and performs at a higher level of isolation and noise rejection. They each come with two sets of MiG 2.0s and are recommended to be placed according to their guide. We preferred the “Ambient Soundstage” configuration but the “Pin Point” worked well in other cases. The Tranquility Base UEF neutralizes harmful EM fields through an inductive Active EM CELL to balance and stabilize EM fields within components. The result is more efficient signal transfer with a measurable increase in dynamic headroom. The MiGs and MiGs 2.0 are very effective isolation pieces. Regardless of the configuration used, the noise floor drops and a veil is lifted. As for the Tranquility Base, the background silences even further and everything lines up into focus. The soundstage also widens in all directions. There are an undeniable cleaner and more pristine quality to the music when the Tranquility Base is in use in our systems. We primarily tested with our digital sources: Lumin S1 and Chord DAVE. When A/Bing with and without, the music was more muffled, less delineated, and less dynamic without the Tranquility Base in place. The sound was more closed in and less “free-flowing.” Swapping it back in and we get more vividness, clarity, and a more granular sound. It’s wiped of any distortion or grain. We heard improvements, even without the active portion turned on, so it does a great job with mechanical isolation in itself. With the active circuit turned on and having it grounded to the Active Grounding Block SE, it’s dead quiet. Pieces of music just “float” in from nothingness. 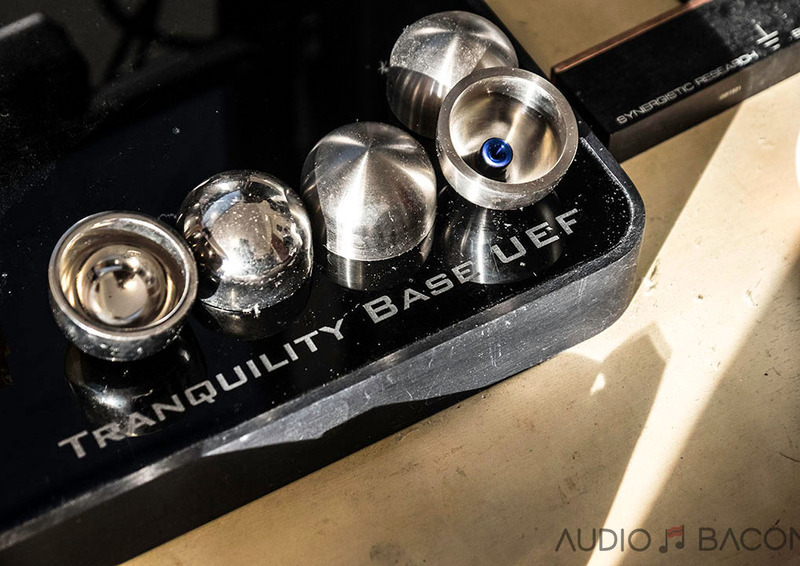 The benefits were clearly audible so these Tranquility Bases ain’t going nowhere. The Synergistic Powercell PC12SE with the Galileo upgrade was also used in later testing along with their respective Synergistic Research cable. 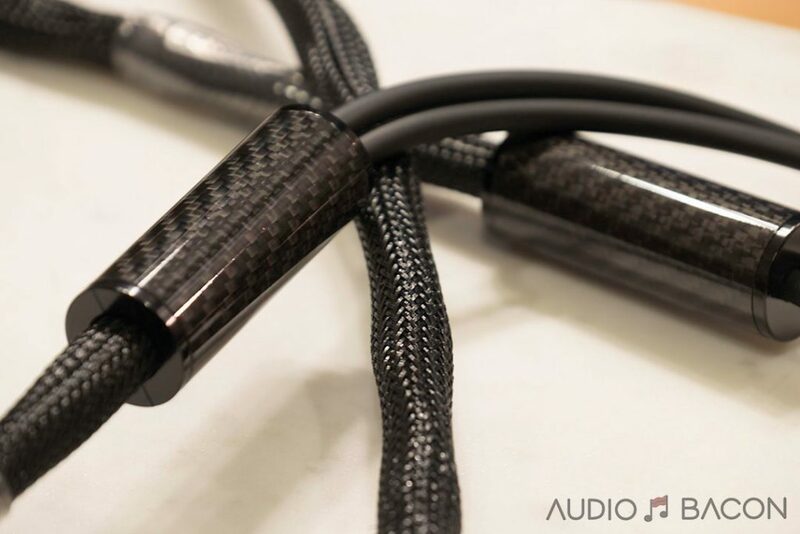 Reading this review I get the impression that while these cables are quite and detailed they may not be very musical or enjoyable to listen to. Is this true? Were you able to compare the tranquility bases with the symposium bases?